Covidien, Monoject 60 cc Syringes are designed for general purposes and wound irrigation. These medical syringes remove surface pathogens and cellular debris found in wound exudates. 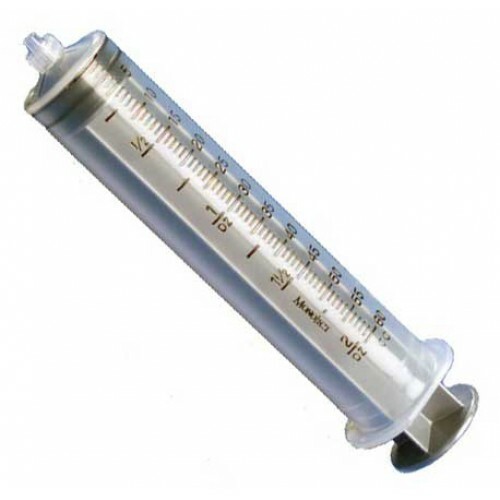 Using a wound irrigation syringe is a highly effective method of wound cleansing. These medical syringes can also be used for evacuating during medical procedures. They can easily be filled with saline, such as CURAD Sterile Saline Wound Wash, water, or other Irrigation Solutions to gently clean a site. Monoject Syringes feature easy-to-read 5 mL or 1 mL graduations. The liquid capacity of these syringes is 60 cc or 60 mL. They feature a thumb ring plunger for one-handed use, are available non-sterile or sterile, and are reusable. The tubing is made from translucent polypropylene, which allows you to easily read the level of irrigation solution inside. These General Purpose Syringes without Needles are latex free. Options for the 60 cc Syringes include regular tip (sterile soft pack), catheter tip (sterile/non-sterile - soft pack/bulk pack), luer lock tip (sterile soft pack & non-sterile bulk pack), and toomey tip (rigid pack). They are individually packaged and are easily opened quickly and conveniently with one step. Tip caps are included on each syringe to provide protection from contamination of fluid pathway. Just what I needed. Quick shipping. Product has been updated and the syringe now includes a backstop. This was not in earlier version of the product and is a great improvement. Our previous large syringes had plungers that were difficult to pull out and push in. These move with ease. Great syringes. Good product. Fast shipping. Great price. EXCELLENT PRODUCT. THERE IS NOTHING LIKE THIS BRAND...!!! !